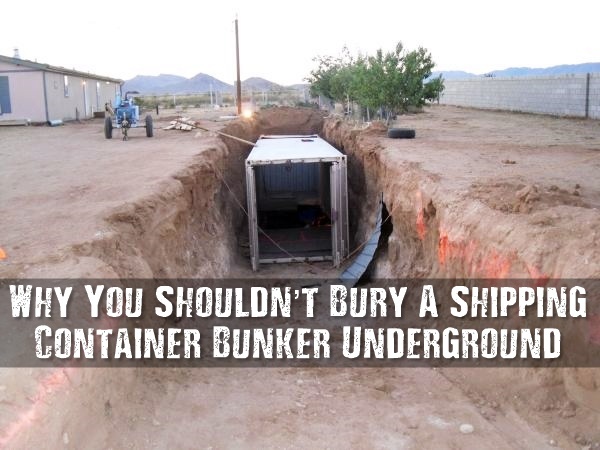 You could be risking your own life and wasting a lot of money if you bury a shipping container bunker incorrectly. It may sound like a good idea, but there are several reasons why it isn’t. You are probably thinking to yourself, “That’s a bunch of BS!” I understand, since burying shipping containers for an easy underground bunker has been floating around as an idea for quite some time now. But it’s my job here to do the research and find out the truth so that all of us can prep and do the right thing in a survival situation. This is why I have put my time and energy into researching this idea to find out if it’s really safe for you. We want to provide the facts and ensure everyone is safe in their prepping and planning. I have read a few articles and watched quite a lot of videos on the subject. If done incorrectly, the shipping containers crush inwards (even with as little as 18 inches of soil overhead)! Can you imagine? You’d put all that hard work into it only to have it ruined with a bit of dirt on the top of it. You’d waste all that money and the supplies, and this could be a true disaster when that survival situation arrives. People inside could die. So, if you had visions of just digging a deep hold, slapping a shipping container in and burying it, think again! We’re going to explore why this is a bad idea, and what you can do instead of you want a DIY underground bunker. There are all sorts of things to consider when it comes to bunker living. It is not nearly as simple as just putting something underground and living out the next few decades as the world collapses. You need to think about family dynamics and how life underground would take its toll on you. Planning for bunker living is about more than just having space to sleep and eat, and the supplies needed to do so. You also need to think about how you will replenish your resources when needed. It’s also important to think about the mental health and well-being of your family living in your bunker with you. Do you ever consider what would happen if someone in the bunker were to go completely stir crazy? These things can happen, and it makes bunker living a big deal. If you’re going to choose bunker living for your fallout shelter or emergency plan, then you need to think of all possible worst-case scenarios so you can be fully prepared for anything that might happen. This planning includes choosing the bunker itself. Some people have bunkers or fallout shelters attached to their homes, or on their personal property. For those who do not, a shipping container seems like a possible alternative. You can use a shipping container for a shelter, but it’s not a good idea to bury it. So, if you’re looking for an underground bunker, a shipping container is not going to be the fix. Let’s look into why. Depending on the reasons behind the SHTF situation you find yourself in, an underground bunker may feel like the safest option. It can help protect you from airborne elements and also from other people or predators. You’ll be better hidden. These are some of the reasons people consider underground bunkers for survival situations, but why do they choose shipping containers for this purpose? A shipping container house can be a great bug out shelter, or temporary shelter if you need to leave your main home. Overall, it comes down to the cost and quality of the bunker. This shipping container method is a failure, however, if you’re trying to bury it. You would be better to bury something that is made to be a bunker. A DIY underground bunker will also assure that you have enough space and organization for all the things you need. You can also include things like plumbing and air filtration. You’re not going to get this from a regular shipping container. “But… but… people have done it! I’ve seen it.” Right, let’s address that since you’ve likely seen cases where it was done, seemingly successfully. Will a shipping container work if you do it correctly? It can! Now, don’t get me wrong if you reinforce them and place struts the container will hold up to the crushing pressures of the soil. That’s simple physics but there is so much more to it. Why waste tons of your hard earned money on something that you think will save your life in a SHTF situation when it may be the thing that actually kills you. 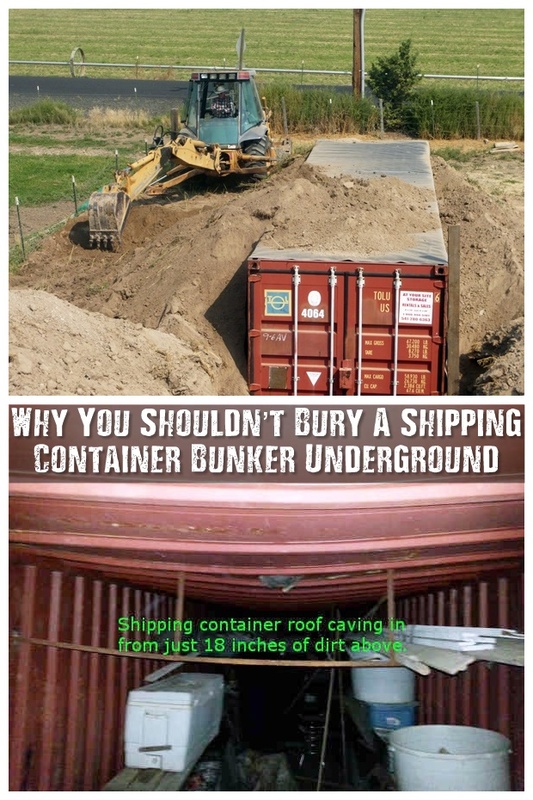 So, what actually happens when you bury a shipping container? This is important to understanding why it’s not such a great idea. You need to know the facts before you start doing this yourself. Many people have the idea that they can build a storm shelter or temporary bunker by simply burying a shipping container. It’s fairly cheap compared to other options, and it seems easy. I mean, all you need to do is dig a deep hole and put the shipping container in it, right? Then backfill the hole afterward. Easy-peasy, lemon-squeezy. That isn’t all there is to it. The problem lies in the backfill. Once you start putting all that dirt back onto the shipping container, you’re going to run into trouble. The reason is: These shipping containers were not made to be survival bunkers. They were not designed to be an underground shelter and their tops are to made to hold the weight of the dirt placed on top when burying it. That alone is reason to avoid it, but if the tops crush in with even a low amount of dirt pressure, imagine what will also happen to the sides? They can crush in and if you’re inside, your fallout shelter will become a death can! If you’re going to use an underground bunker, you need something that is made for this purpose. Have you thought about box culverts? These could be a viable alternative. Or you need to have the skills to reinforce it yourself. If you feel confident that you could properly reinforce your shipping container to avoid collapse, then this may still be a viable option for you. However, we don’t want to see anyone waste their money and effort, or end up injured or killed, because they tossed a non-reinforced shipping container into the ground and covered it with dirt, calling it an emergency shelter. Be careful! So now that we have discussed it, maybe the shipping container bunker isn’t an option for you. 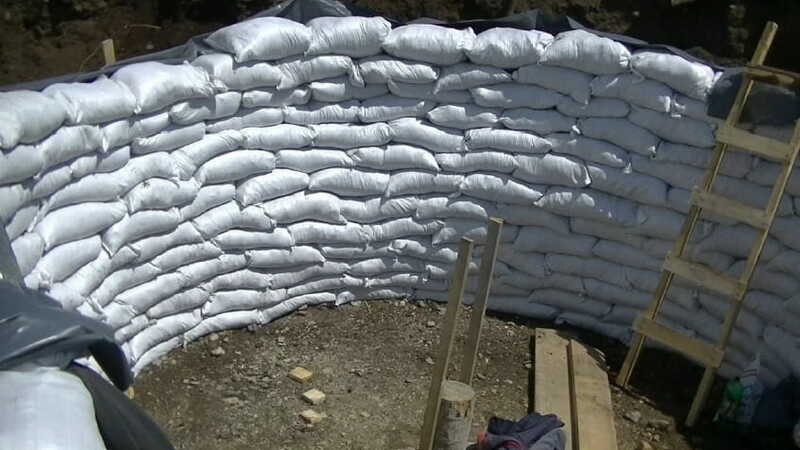 Another option you can look into is building a backyard root cellar that can be used as a bunker. Do you remember the old root cellars our great-grandparents used to have? In fact, they probably built it themselves, right in their back yard. Easy Cellar will also show you how a 70-year-old veteran built a small nuclear bunker in his backyard with $421. That’s on the extreme end of DIY, but it can be done.